A generic name for a small group of vaguely palm-like ferns: Parablechnum procerum, Lomaria discolor, Parablechnum novaezelandiae (Blechnaceae), & Pneumanopteris pennigera (Thelypteridaceae). In many parts of the Pacific, a reflex of the original Proto Malayo Polynesian root word *biRu denotes one or more species of fan palm. The Mäori reflex, a reduplicated form of the Proto-Polynesian root *piu (which elsewhere in Polynesia generally denotes the fan palm Pritchardia pacifica), is a term applied to four species of fern, three of which (Parablechnum procerum, Lomaria discolor, and Pneumanopteris pennigera) develop short trunks (up to a metre high in the case of P. pennigera), and the fourth (Parablechnum novaezelandiae) has a profusion of broad fronds which can reach up to 3 metres in length in ideal situations. 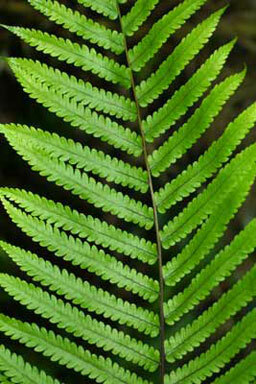 While they share the designation of a single name inherited from earlier stages of the Polynesian language, each of these ferns is also known by other, locally developed names. 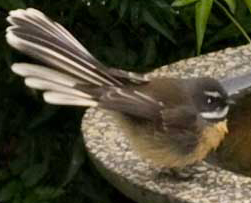 The Parablechnum and Lomaria species are endemic to New Zealand; the Pneumanopteris is also found natively in Australia. Parablechnum novaezelandiae has the largest number of alternative names (perhaps reflecting its variability and tendency to hybridize with some other Parablechnum species): horokio, kiokio, korokio, koropiu (this incorporates the inherited root word), koropio, mokimoki, tupari and rautao; Lomaria discolor is also known as petipeti, täniwhaniwha and turukio; Parablechnum procerum as kiokio (note the shared element, kio, in these sets of names); and Pneumanopteris pennigera as päkau and päkauroharoha. 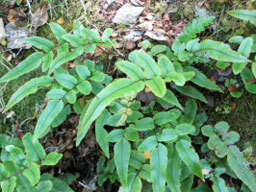 Young Blechnum discolor (Te Mära Reo). Mature plants will have a short trunk. Note: The Mäori cognate, piupiu, is a generic name for four species of fern, each of which has one or more alternative names (see text for details). There is basic information about all these ferns (along with more photographs) on the NZ Plant Conservation Networks web site: Lomaria discolor, Parablechnum novaezelandiae (including the Department of Conservation photograph reproduced above), P. procerum and Pneumanopteris pennigera. 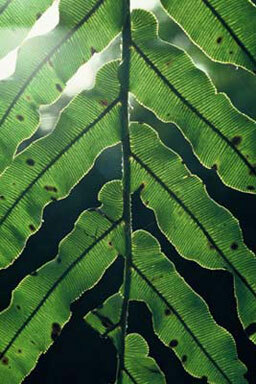 The photograph of Pneumanopteris pennigera is by Larry Jensen, on the University of Auckland Biological Sciences site, which also has some information about the medicinal uses of this fern. 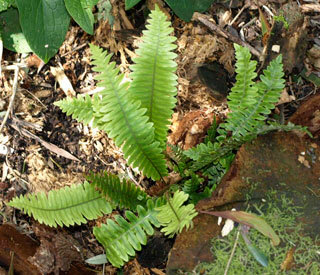 The photo of Parablechnum procerum is from the Driftwood Eco-tours (Marlborough) web site.